The incredible tale of the book you always wanted to write! GTW says, "It's hard to jump out of the box and do something new, but this short book will help you realize we're all in this together! Loved it!" T. Foster says, "It made me want to write that book I keep thinking about. Maybe I'll go eat a sandwich and then start." Kelsea M. says,"...the perfect little motivator. 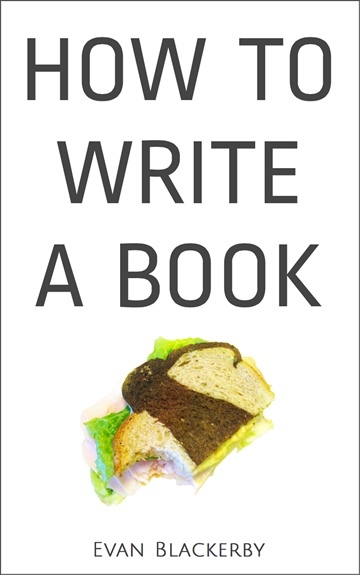 This book will help to get some pep in your step and words on your pages by ultimately encouraging you to put all things aside and write for the sake of writing. So what are you waiting for?" Paige says, "A great little book with a great big message ..."
Nancy says, "I would recommend this book to any "want to be a writer" I laugh out loud. Short and to the point." Lillian says, "The best writing guide I have ever used! Totally wonderful! Great for anyone, adult or child! I completely adore this book!" MJA says, "Scam. Do not buy this. A book with no contents. Digital scam." Chip says, "It wasn't what I thought it to be. The one star rating reflects my displeasure at the "product" I paid 99 cents for."